In 1850, the first medical college for women in the United States—the Female Medical School of Pennsylvania—opened in Philadelphia. Originally housed in a rented building on Arch Street, depicted in this illustration, in 1862 the college relocated to a new, much larger and better-equipped facility on North College Avenue. In 1867, it became the Woman’s Medical College of Pennsylvania (WMCP). In 1930, the WMCP moved once more to a still larger facility in the growing neighborhood of East Falls. 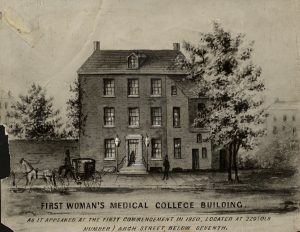 The Female Medical School of Pennsylvania, later renamed the Woman’s Medical College of Pennsylvania (WMCP), opened during an era of reform, just two years after the first woman’s rights convention at Seneca Falls, New York. The college’s founders, early supporters, faculty, and earliest students reflected this reform mindset. The inaugural class of 1852, for example, included Chester County-bred Quaker Ann Preston, who had been active in the abolition, temperance, and women’s rights movements. Although her formal education was cut short when her mother fell ill, Preston attended lectures at the local lyceum and literary associations while caring for her family. 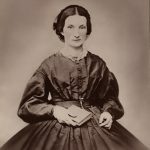 In her twenties, Preston began teaching hygiene and physiology classes for women before beginning a two-year medical apprenticeship under Dr. Nathaniel Moseley. Preston’s sought to educate women about their bodies. Like so many other women of her time, she had been rejected from several medical schools in the Philadelphia region, so when the WMCP opened in 1850, she enrolled immediately. After completing an additional year of courses, Preston became professor of hygiene and physiology. Preston understood the value of practical clinical experience. Minimal even at traditional male medical schools, clinical training was even harder for female students to access. For this reason, Preston led the effort to establish the Woman’s Hospital of Philadelphia on North College Avenue. The hospital, which opened in 1861, offered surgical and medical care for women and children. More importantly, it provided practical clinical experience for the WMCP students. In 1863, Preston helped establish a training program for nurses at the hospital. By the end of the decade, the Woman’s Hospital had become a flourishing independent institution known for its women surgeons, internships, and early nursing school. Preston went on to become the first woman dean of the WMCP—and of any medical school—in 1867, initiating a tradition of women deans at the college that continued unbroken for one hundred years. In 1862, the Woman’s Medical College of Pennsylvania (WMCP) moved from its original location at 627 Arch Street into this well-equipped new building on North College Avenue next to the Woman’s Hospital of Philadelphia. In addition to ample lecture halls, the new facility included a large library, a chemistry lab, and dissection rooms. 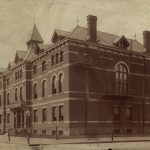 In 1887, the college began an outpatient maternity service in South Philadelphia, and in 1895 established a nearby dispensary at 333-335 Washington Avenue. Students cared for women and children in homes throughout the neighborhood—dubbed the “South Pole” by the students for its geographical and social remoteness from their world on North College Avenue—gaining invaluable experience and providing healthcare to a marginalized community of immigrants and African Americans. In 1862, the Woman’s Medical College of Pennsylvania (WMCP) moved from its original location at 627 Arch Street into a well-equipped new building on North College Avenue next to the Woman’s Hospital of Philadelphia. 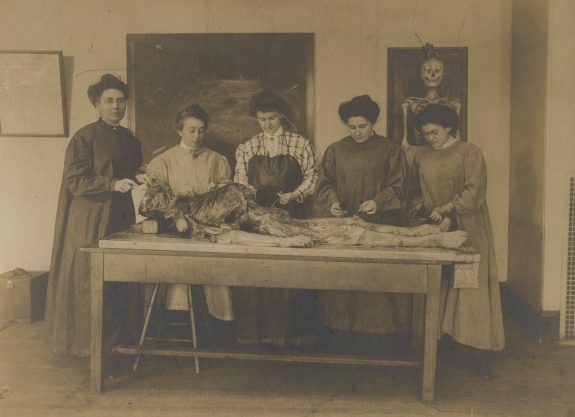 In addition to ample lecture halls, the new facility included a large library, a chemistry lab, and dissection rooms, like the one shown in this 1901 photograph. The college also hired additional faculty, including Dr. Anna Broomall, a master teacher of obstetrics who established one of the nation’s first outpatient maternity services in South Philadelphia in 1887. Other notable faculty members included William W. Keen, considered the nation’s first brain surgeon, and Henry Hartshorne, an expert in the diseases of children and respected textbook author. The Woman’s Medical College of Pennsylvania (WMCP) attracted a relatively diverse student body inclusive of race, ethnicity, and religion. Beginning in the early 1880s, the college admitted students from Asia. 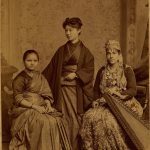 This photograph – taken at a Dean’s reception in 1885 – depicts three WMCP graduates who defied prevailing gender and cultural expectations to become the first women in their countries to earn a degree in Western medicine. 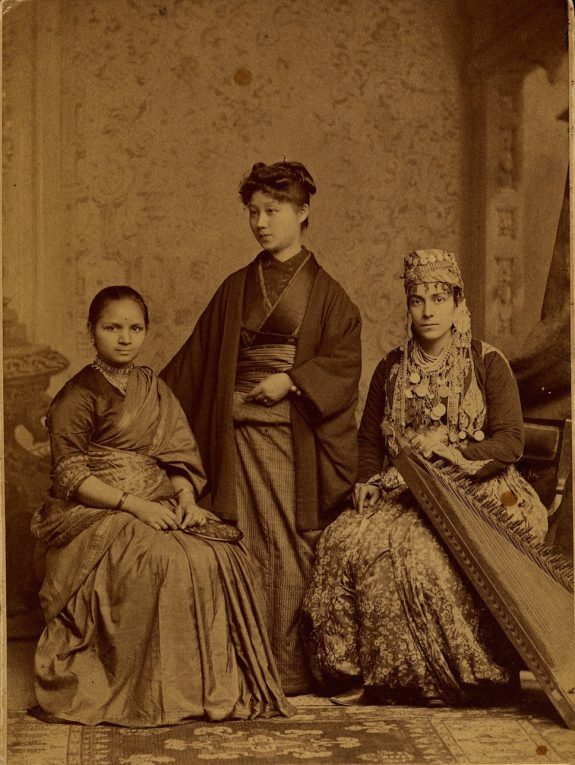 Shown from left to right are Anandibai Joshee (India), who graduated in 1886; Kei Okami (Japan), who graduated in 1889; and Sabat Islambooly (Syria), who graduated in 1890. By 1900, at least twelve African American students had graduated from the Woman’s Medical College of Pennsylvania (WMCP), including Rebecca Cole, Eliza Grier, and Matilda Evans. Another alumnae, Dr. Susan LaFlesche, was the first Native American female physician in the United States. LaFlesche, pictured here, was born on the Omaha Reservation in Nebraska. As a young girl, she witnessed the death of a Native American woman who had been refused medical care by a white physician. Later in life, LaFlesche cited this incident as her primary motivation for obtaining medical training. Following graduation, she returned to Nebraska where she worked for the Bureau of Indian Affairs as a reservation physician. 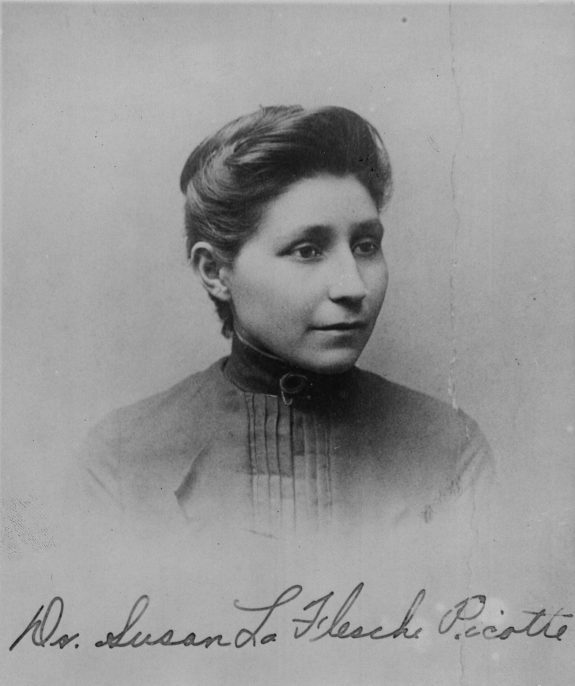 LaFlesche received one-tenth the salary of a Navy or Army doctor, even though that she provided round-the-clock medical care for more than one thousand white and Native American patients. 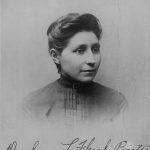 In 1894, she married Henry Picotte and moved to Bancroft, Nebraska, where she opened a private practice. For the rest of her life, LaFlesche fought for Native American rights and continued to educate her people about the importance of hygiene and sanitation. In 1913, she opened a hospital on an Omaha reservation, fulfilling a life-long dream. She died two years later at the age of 50. The Woman’s Medical College of Pennsylvania (WMCP) trained thousands of women physicians from all over the nation and the world, many of whom went on to practice medicine internationally. Dr. Clara Swain, for example, graduated from the WMCP in 1869 and became the first woman medical missionary, traveling to India following graduation. In addition, the Guntar Mission Hospital was founded in 1897 by WMCP alumna Dr. Anna S. Kugler. Dr. Kugler arrived in India in 1883 and practiced medicine there for nearly half a century. Following her death, the Guntar Mission Hospital was renamed in her honor. 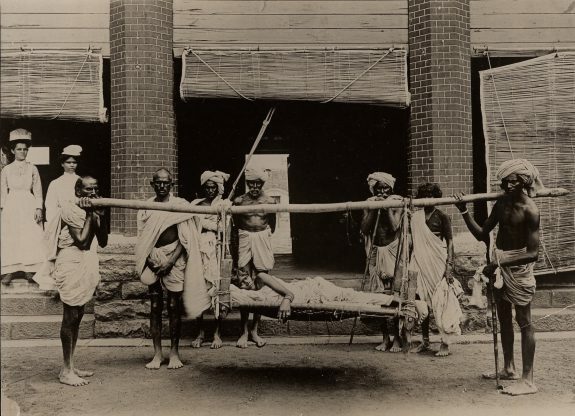 In this photograph, a female patient arrives at the hospital on a stretcher. 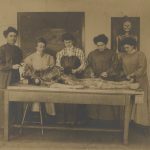 Woman’s Medical College of Pennsylvania (WMCP) faculty and alumnae expanded students’ opportunities for academic and real-world medical experience in the late nineteenth century. Dr. Amy S. Barton graduated from the WMCP in 1874. Following graduation, Barton became interested in ophthalmology and – after surmounting gender-based discrimination – gained acceptance to the Wills Eye Hospital, where she assisted the renowned ophthalmologist George Strawbridge for more than a decade before returning to the WMCP as professor of ophthalmology. Concerned that entirely too much emphasis was placed on teaching female medical students obstetrics and gynecology, Barton was determined to establish a clinic where all branches of medicine could be practiced. 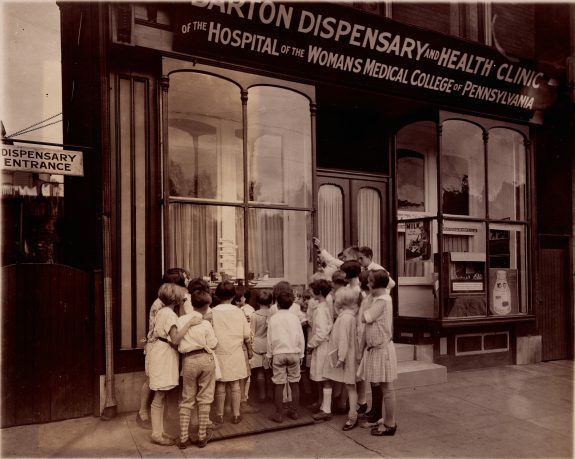 On October 31, 1895, Barton’s vision came to fruition with the opening of the Hospital and Dispensary of the Alumnae of the Woman's Medical College of Pennsylvania in South Philadelphia. Not only did the dispensary hold tremendous educational value for the WMCP students, it also served a community whose poorest residents might otherwise have no access to quality health care. 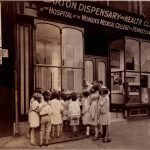 In this 1927 photograph, children examine a window exhibit while waiting in line at the dispensary, which by this time had moved to 333-335 Washington Avenue and had been renamed the Barton Dispensary and Health Clinic. In the early twentieth century, the number of women seeking careers in medicine declined. At the same time, previously male-only medical schools began admitting a small number of female students. As a result, enrollment dropped at the Woman’s Medical College of Pennsylvania (WMCP). 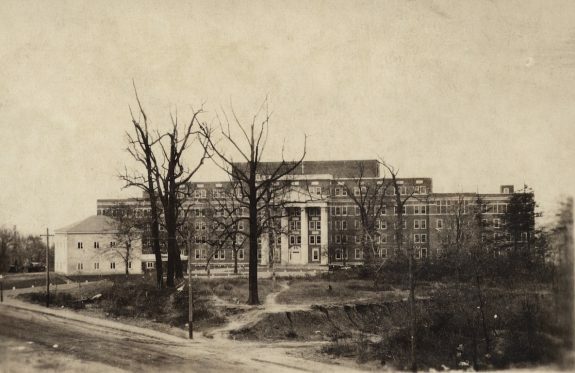 Despite these hardships, the college managed to stay open, and in 1930 the hospital and college moved to the new, larger facility at 3300 Henry Avenue, shown in this 1931 photograph. In 1970, one hundred and twenty years after its founding, the WMCP admitted men and changed its name to Medical College of Pennsylvania. In 1995, the Medical College of Pennsylvania merged with Hahnemann University’s medical school (founded in 1848) and operated under several organizational structures until it became the Drexel University College of Medicine in 2002. The Woman’s Medical College of Pennsylvania played a key role in establishing Philadelphia as a pioneering center for medicine and a leader in women’s higher education. The Woman’s Medical College of Pennsylvania, founded in 1850 as the Female Medical College of Pennsylvania, was the first medical school in the world for women authorized to award them the M.D. It was established in Philadelphia by a group of progressive Quakers and a businessman who believed that women had a right to education and would make excellent physicians. Renamed the Woman’s Medical College in 1867, the school trained thousands of women physicians from all over the world, many of whom went on to practice medicine internationally. The college provided rare opportunities for women to teach, perform research, manage a medical school, and, with the establishment of Woman’s Hospital in 1861, learn and practice in a hospital setting. It was the longest-lasting all-women medical school in the nation, until it became coeducational in 1970, admitting four men into what became the Medical College of Pennsylvania. 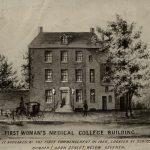 The Woman’s Medical College of Pennsylvania (WMCP) was founded during an era of reform, just two years after the first woman’s rights convention at Seneca Falls, New York, asserted women’s rights to an education and a profession, among other rights. The college’s founders, early supporters, faculty, and earliest students reflected this reform mindset. The founders and early faculty included Quaker and non-Quaker activists for prison reform, abolition, and temperance. Founder William J. Mullen (1805–82) was a wealthy manufacturer turned philanthropist. A prominent advocate for prison reform, he worked as a prison agent at Moyamensing Prison and established the House of Industry in South Philadelphia, a neighborhood center that provided temporary shelter, job training, and English-language courses to immigrants and the homeless. Mullen served as the first president of the Board of Corporators of Woman’s Medical College. Others include Quaker activist-physicians Dr. Joseph S. Longshore (1809–79), longtime temperance and abolition advocate, and Dr. Bartholomew Fussell (1794–1871), a Chester County abolitionist, whose nephew, Dr. Edwin Fussell (1813–82), was one of the earliest faculty members. The inaugural class of 1852 included Chester County-bred Quakers Ann Preston (1813–72) and sisters-in-law Anna Longshore (1829–1912) and Hannah Myers Longshore (1819–1901), all of whom pursued rigorous education from childhood. Ann Preston went on to become the first woman dean of WMCP—and of any medical school—in 1867, initiating a tradition of women deans at the college that continued unbroken for one hundred years. As dean, Preston determined to provide Woman’s Medical College students with the best clinical training available. Minimal even at traditional male medical schools, clinical training was even harder for female students to access. Preston arranged for her students to attend clinical demonstrations at the Blockley Almshouse (later known as Philadelphia General Hospital) in West Philadelphia and led the effort to establish the Woman’s Hospital of Philadelphia on North College Avenue to provide care to women and children as well as clinical experience for the female faculty and students. The Woman’s Hospital became a flourishing independent institution known for its women surgeons, internships, and early nursing school. 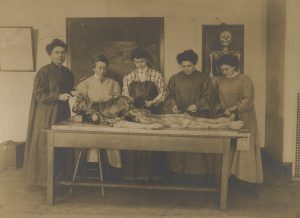 WMCP faculty and alumnae expanded students’ opportunities for academic and real-world medical experience in the late nineteenth century. In 1862, the college moved from its original location at 627 Arch Street into a well-equipped new building on North College Avenue next to the Woman’s Hospital, near Girard College and not far from another Quaker-supported initiative, Eastern State Penitentiary. 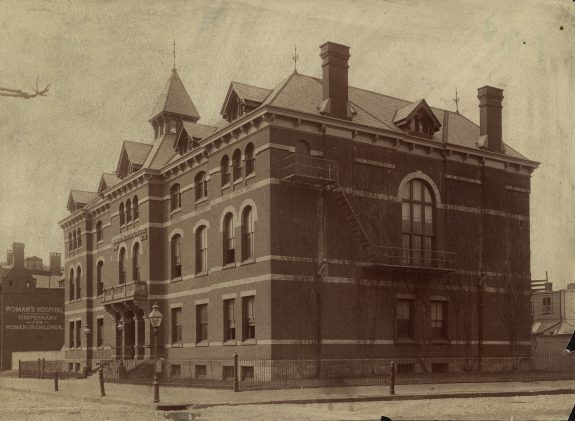 In 1887, the college began an outpatient maternity service in South Philadelphia, and in 1895 established a nearby dispensary at 333-335 Washington Avenue. Students cared for women and children in homes throughout the neighborhood—dubbed the “South Pole” by the students for its geographical and social remoteness from their world on North College Avenue—gaining invaluable experience and providing healthcare to a marginalized community of immigrants and African Americans. In 1930, WMCP moved to the growing neighborhood of East Falls. Women in medicine continued to struggle with acceptance in a man’s medical world, as demonstrated by what came to be known as the “Jeering Episode.” In 1869, after several rejected attempts, Ann Preston won the right to bring her students to Pennsylvania Hospital to take part in clinical instruction. When they arrived in the surgical amphitheater, male students catcalled, spat upon, and assaulted the women with spitballs and tobacco juice. Philadelphia newspapers picked up on the story and most sided with the women—not because they believed that women should be doctors, but primarily because the male students’ behavior was “un-gentlemanly.” The incident and ensuing publicity encapsulated the social debates about gender roles at the time, and the “Jeering Episode” became an essential element of the Woman’s Medical College’s identity for generations. 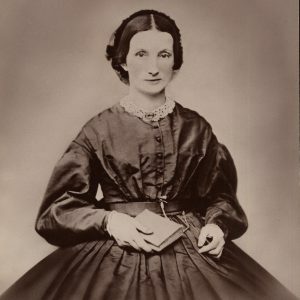 A number of important early women physicians graduated from WMCP: Mary Putnam Jacobi (1842–1906), the leading American woman medical scientist of the nineteenth century; Clara Swain (1834–1910), the first woman medical missionary, traveling to India in 1869; Anna Broomall (1847–1931), a master teacher of obstetrics who created an early program of prenatal visits; and Catherine Macfarlane (1877–1969), who conducted the first study in preventing pelvic cancers. WMCP always claimed a relatively diverse student body, inclusive regardless of race, ethnicity, or religion. It graduated some of the earliest African American women doctors, including Rebecca Cole (1846–1922), Eliza Grier (1864–1902), and Matilda Evans (1872–1935); the first Indian woman doctor, Anandibai Joshee (1865–87); the first Native American woman doctor, Susan LaFlesche Picotte (1865–1915); and other women M.D.s originally from China, Syria, and South America. The college also admitted Jewish students in the nineteenth century—earlier than many other medical schools—reflective of the growing Jewish immigrant community in South Philadelphia. In the mid-1940s the school accepted five Japanese-American students, at least three of whom had been imprisoned in internment camps. Many of these women went on to serve their respective communities. One hundred and twenty years after its founding, in 1970, the Woman’s Medical College admitted men and changed its name to Medical College of Pennsylvania. In 1995, the Medical College of Pennsylvania merged with Hahnemann University’s medical school (founded in 1848), operating under several organizational structures until it was established as the Drexel University College of Medicine in 2002. The Woman’s Medical College of Pennsylvania played a key role in establishing Philadelphia as a pioneering center for medicine and a leader in women’s higher education. Melissa M. Mandell is a Philadelphian and public historian who has most recently worked on digital history projects for the Drexel University College of Medicine Legacy Center Archives & Special Collections, and the Historical Society of Pennsylvania. Abram, Ruth J. “Send Us a Lady Physician”: Women Doctors in America, 1850–1920. New York: W. W. Norton & Company, Inc., 1986. Alsop, Gulielma Fell. 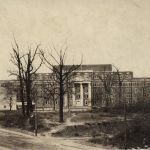 History of the Woman’s Medical College, Philadelphia, Pennsylvania, 1850–1950. Philadelphia: J. B. Lippincott Company, 1950. Morantz-Sanchez, Regina Markell. Sympathy and Science: Women Physicians in American Medicine. Chapel Hill: University of North Carolina Press, 2000. First published 1985 by Oxford University Press. Morantz, Regina Markell, Cynthia Stoldola Pomerleau, Carol Hansen Fenichel, eds. In Her Own Words: Oral Histories of Women Physicians. Westport, Conn.: Greenwood Press, 1982. More, Ellen S. “A Certain Restless Ambition: Women Physicians and World War I.” American Quarterly 1, no. 4 (December 1989): 636–60. Petizman, Steven J. A New and Untried Course: Woman’s Medical College and Medical College of Pennsylvania, 1850–1998. New Brunswick, N.J.: Rutgers University Press, 2000. Drexel University Legacy Center Archives & Special Collections, 2900 West Queen Lane, K Wing, Philadelphia. College of Physicians of Philadelphia Historical Medical Library, 19 South Twenty-Second Street, Philadelphia. Barbara Bates Center for the History of Nursing Archives and Collections, University of Pennsylvania University Archives and Records Center, 4015 Walnut Street, Philadelphia. Ann Preston birthplace historical marker in Chester County, 225 State Road, West Grove, Pa. Female Medical College of Pennsylvania historical marker, Drexel University College of Medicine, main entrance, 2900 West Queen Lane, Philadelphia. Female Medical College Historical Marker, 3300 Henry Avenue, Philadelphia. Musical Fund Hall (site of first Woman’s Medical College commencement), Eighth and Locust Streets, Philadelphia. Pennsylvania Hospital Surgical Amphitheater, Pine Building, 800 Spruce Street (enter on Eighth Street), Philadelphia . Site of West Philadelphia Hospital for Women, now Sarah Allen Senior Homes (Woman’s Hospital on North College Avenue eventually merged with the West Philadelphia Hospital for Women), Parrish and Preston Streets, Philadelphia. records a woman named Mary Ellen McCullough, MD. She’s only listed for the one yr.
I’ve tried various venues/records to find what school she attended or any information about her. students at the Women’s Med School? And how would I access it? Thank you for your kind response. Dear Ms. Mandell. It is with great enthusiasm that I read your article. Thank you. My grandmother graduated from Women’s Medical in 1926 Dr. Muriel Ramsey. I have always been proud to bear her last name and she has been a source of pride in our family.